Although the crank ice cream freezer wasn’t invented until 1843, and the first large-scale commercial ice cream plant in 1851, research shows that ice cream was first created in the cold regions of China more than 4,000 years ago. There, milk and cream, perhaps some overcooked rice, and spices were packed in snow to harden. Fruit ices were also developed, prepared with fruit juices, honey and aromatic spices. 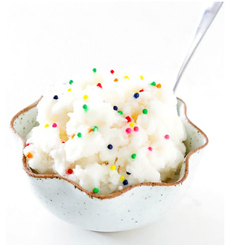 Snow and saltpeter served as an ancient ice cream maker to freeze ingredients in a container. Through trade routes, the frozen desserts were introduced to Persia about 2,500 years ago. The Persians called the frozen concoction sharbat, “fruit ice” in Arabic and the origin of sherbet, sorbet and sorbetto. Alexander the Great, who battled the Persians for 10 years before finally toppling the Persian Empire in 330 B.C.E., discovered fruit “ices” sweetened with honey and chilled with snow. He returned to Greece with the knowledge; and within three centuries, Emperor Nero was serving fruit juices mixed with honey and snow at his banquets. Here’s more on the history of ice cream. First up is a simple recipe from Julie Blanner for strawberry snow cream, ready in just three minutes. *Instead of Nesquik, you can purée frozen strawberries and add sweetener as desired. 1. COMBINE the Nesquik and milk, and pour over the snow. Blend as desired. Sweeteners: try whatever you like, from honey and maple syrup to lower-glycemic sweeteners like agave and sucralose (Splenda). Flavors: Instead of fruit or juice, add an extract to the snow: coffee, lemon, mint, vanilla, etc. Top photos: An ancient recipe with modern decorations, and the preparation process, from GimmeSomeOven.com. 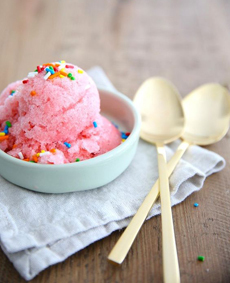 Bottom: Strawberry snow ice cream from Julie Blanner. Milk type: You can use almond milk, coconut milk, soy milk, and other nondairy options; and can add more flavor with the flavored varieties (chocolate, coffee, green tea, vanilla, etc.). Ice cream and sorbet are just two types of frozen desserts. Discover more in our Frozen Desserts Glossary.